When I opened the jar - I thought 'yum!' as it smelt really nice and rich! Opening the jar was easy. The jar looks very fancy to me - it makes it look like it's not your standard cheap mustard - it makes it look special. I first used the dijon mustard to make a delicious mustard mayonnaise for with salad. It was really easy to use. The consistency of it is just right - not too thick and not too thin. The flavour was nicely strong, but not overpowering. It was really easy to use to make into mustard mayonnaise as a dressing for salad and it tasted very delicious. I also had some with just a ham and lettuce sandwich and it was equally delicious on its own. It is easy to store once opened - just pop it in the fridge. 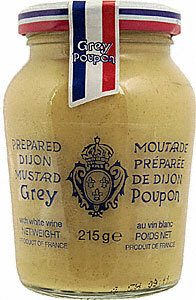 The recipe for the Grey Poupon Dijon Mustard is over 200 years old and it has never lost its quality. It is stated that it is the only Dijon Mustard to contain white wine as part of its recipe. Grey Poupon Mustard is available from Tesco, Waitrose and Asda stores and select independent food stores nationwide.